Our Lady of the Assumption Church in Woodbridge welcomed Father Christopher Ford to take over the helm of the Parish after the retirement of Father Gene Gianelli. Father Ford came to Woodbridge from Waterbury, where he served as rector of the Basilica of the Immaculate Conception and Episcopal Vicar for the Waterbury Vicariate. According to the bio published on the Assumption Church website, Father Ford was born in Hartford and grew up in Needham, Mass. As a young adult, his parents moved to Madison, where they lived the next 30 years. Father Ford attended Syracuse University where he received a degree in Public Policy: Urban Affairs from the Maxwell School of Public Administration. Feeling drawn to the priesthood, he enrolled in St. Charles Borromeo Seminary in Philadelphia and was ordained a priest in 1987. After serving four years in St. Francis of Assisi in Naugatuck he was appointed by Archbishop John Whealon to graduate studies in Rome. 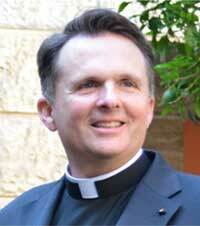 In 1993, he received a license in Canon Law from the Pontifical Gregorian University. Upon returning home he has served in various parishes and in the Metropolitan Tribunal as both judge and defender of the bond. His previous pastorates include St. Justin in Hartford and St. Mary in Branford.